When Round 10 of the 2011 MotoGP Championship wrapped up Sunday at the shortest track on the schedule, Laguna Seca, Repsol Honda’s Casey Stoner took his fifth win of the season. 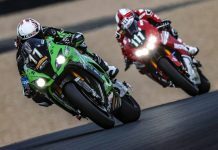 The Australian had much work en-route to the checkered flag, including passing the reigning MotoGP Champions, Yamaha Factory Racing’s Jorge Lorenzo. The Spaniard Lorenzo, who started from the pole, lead every lap until the final six when Stoner passed him. Lorenzo would eventually finish 5.6 seconds behind Stoner, with Repsol Honda’s Dani Pedrosa taking the final podium position. Attached is an official FIM video, highlighting the 2011 Red Bull US GP.